Dark red will make hairstyle bright and help to stand out and attract attention to yourself. Dark red color can be obtained with help of different staining techniques. Let’s ascertain how to get a dark red hair color. How to get a dark red hair color and keep them healthy, you will know in our article. Melioration is a delicate coloring technique, much safer than classic hair coloring. Paint is not applied to all strands. Besides coloring doesn’t start from roots of hair, but a little lower. So you will rarely have to renew your hair. Melioration allows you to paint strands in a few shades you like, for example, amber and garnet. With this marvelous technique you can easily create a dark red color on strands. This wondrous technique is not appropriate for everyone, but mostly for dark-haired ladies. The best combination of dark red strands will be if most of hair is black, you should create a beautiful contrast to the hair. For making brighter red strands, then before doing melioration, it is desirable to lighten hair. Coloring is a technique similar to melioration, but in this case, a combination of different shades are made on the hairstyle. Dark red color can be either basic or a set of different shades, in which strands will be painted. For example, original will look a combination of bright and muted hues, such as red copper and fiery red. To dilute red shades and make image more restrained and calm, you can color strands in red-brown or add to hair only brown shades of dark and light colors. If it is brown, add amber to your hair or color strands in a garnet or ruby. Coloring, like melioration, you can do at home, for this, there are special sets and colors for procedure on sale. Another sparing staining technique is ombre procedure. Ombre is a sleek transition of color, usually from murky to gentle, but maybe the reverse if you have light hair hue. Ombre provides many opportunities for combining dark red with others. If red is base color, then transition can be made, for example, from it to bright red. 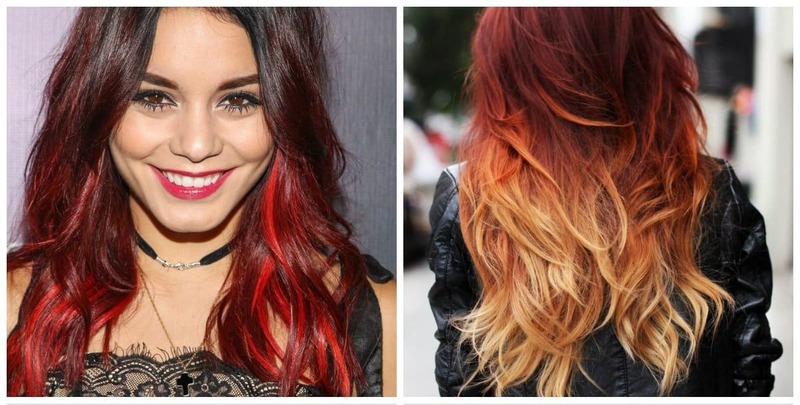 Ombre will look great with transition from black to dark red. Or dark red can be made an intermediate color and ends painted in some brighter shade, this technique is known as multitone ombre. For dark long wavy hair ombre technique simulating flames will look great. Today, ombre can be carried out at home, this staining is done without use of foil. Most dye needs to be applied to hair’s lower part, and it takes longer to keep paint there (about 20 minutes) because this zone should be painted the hardest. To paint middle part of head it will be enough to hold paint on your hair for about 10 minutes. Before painting, paint from bottom of hair should be washed off, and hair must be slightly dried.